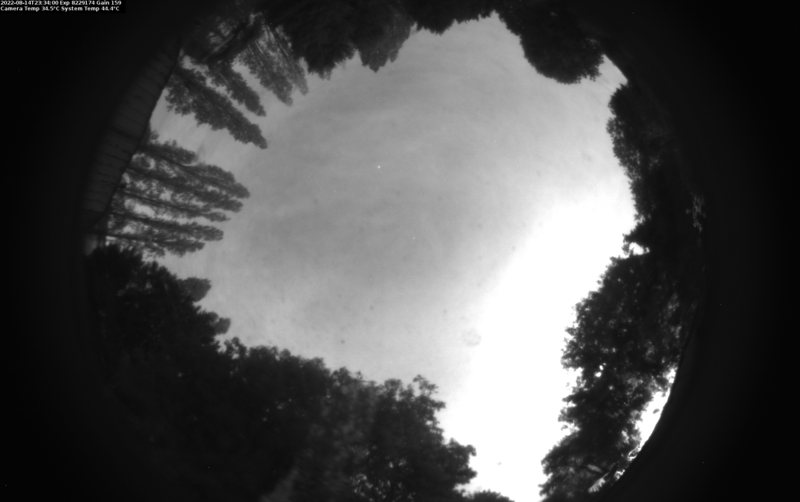 The All Sky Camera looks up from the village of Bourn in Cambridgeshire, UK. It's fully weatherproof and images the sky 24/7. You can see clouds, stars, meteors, satellites, aeroplanes and their contrails, clouds, sun, moon, rain, clouds, and their movements across the sky. Clouds from the left, clouds from the right. Clouds from three different directions simultaneously. Did I mention the clouds? The time-lapse cloudscapes can be facinating and beautiful, if somewhat frustrating for astronomy. The all sky cam animated loop page displays a loop of the last hour's worth of images. Each loop takes around 6 seconds to display and a new image is added into the loop once a minute. Useful for keeping track of the state of the sky as the night progresses. This feed is from the new Mk2 camera system. It is still experimental and may go down from time to time, so no guarantees as to its availability. Currently the old mk1 camera feed is still available and can be found here. Movies are generated from the Mk1 camera at one frame per minute, and played back at 10 frames per second. You see an hour of sky every 6 seconds. Click on the links below to view the movies. The movies are encoded in H.264/MPEG-4 AVC format. I you have problems viewing these movies in your standard media player then I recommend the free VLC Media Player (versions for Windows, Linux and Mac are available). The current custom-built all sky camera consists of a Fujinon FE185C086HA-1 fish-eye lens, ZWO ASI174MM mono camera and a Raspberry Pi controller. These components are sealed within a weatherproof box topped with a perspex dome. Image capture and exposure control is handled by custom software on the Pi. The images are stored on, further processed as required, and served from the observatory's "Sky Eye" server box. Compared to our previous Mk1 generation cameras the image quality has improved by an order of magnitude. Resolution has increased to HD rather than SD equivalent levels, camera noise is much reduced thanks to an improved sensor and a purely digital pathway, and the new fish-eye lens provides superior optical quality. The All Sky Camera project started life in May 2008 and has been faithfully recording the sky, with the odd interruption due to hardware failures, ever since. The original Mk1 all sky camera configuration has now been superseeded by the Mk2 design, which was introduced in February 2018. The Mk1 hardware and software configuration constantly evolved over its lifetime, with software improvements, and failed hardware replacements and upgrades. The imaging system consisted of various versions of the Mintron integrating video cameras, such as the Mintron 12V6HC-EX mono camera. Several other variants have been used including colour models. In low-light situations an integrating video camera internally combines multiple frames (up to 128) to image at star-light illumination levels. The colour cameras are less sensitive, but better illustrate the level of local light pollution - showing differences in colour between low and high clouds. In addition eight of these frames are averaged together offline to further smooth the image. To better capture transient phenomena such as meteors, pixels above a certain brightest level in individual frames are preserved and not averaged. The cameras were typically coupled with either a Rainbow L163VDC4P or Fujinon YV2.2x1.4A-SA2 fish-eye lens. Mk1 camera settings were controlled via an RS485/RS232 converter camera-to-PC connection and Mintron's camera control software (63V5H). The original video server, used to capture and digitize the Mintron video output, was based on the Aviosys 9100B-RS, upgraded with the Yoics firmware hack. After several years this was replaced by an Eptascape ADS-200. Videos servers provide a live camera feed to any computer on the LAN. In addition to the all sky cam, the video servers also support an observatory monitoring camera and a western horizon facing "sunset" camera - the feeds for which are not directly accessible via the web. A Linux based server grabs individual images from the video server, integrates eight frames together per minute to help reduce image noise, and creates and stores the various time-lapse movies. The heavy lifting is done with mencoder, and the system is glued together with simple shell script cron jobs. The all sky camera project was inspired by early experimental nighttime timelapse movies created using a Canon 20D DSLR and Peleng Fish-eye Lens. Clear midwinter night - the constellations rotate from Pegasus through to Virgo. Midsummer night with sunset lit clouds merging into sunrise lit clouds. Clouds from the left, clouds from the right, plus contrails. Confused clouds, wind and rain. Clear moonless midsummer night with milkyway. Mk2 camera images from February 2018 onwards are available to browse and download. Mk1 camera images and movies from May 2008 onwards are available to browse and download. All the timelapse movies are stored as AVI files in this directory. You can also find the individual minute-by-minute frames (that the movies are constructed from) in sub-directories organized by year. All timestamps are UT/GMT. Dates used for movie filenames and directory organization are in ISO date format: [year][month][day]. The movies and images from the Mk1 camera are orientated North upwards and West to the right. Movies prior to 20090630 are oriented with E up and N right. Early images are from a monochrome camera, Between July 2009 and March 2010 a colour camara ran in parallel with the monochrome, after that there were periods of colour and mono only. Mk2 images are approximately orientated with N to the left and W to the top. Similar setups, useful information, and professional observatory all sky cameras: The Cambridge Institute of Astronomy All-Sky Camera, University of Herts Bayfordbury AllSky Camera, MMTO Sky Camera, Cloudbait Observatory, JAT Observatory, MASCOT (ESO Parnal) and LasCam (ESO La Silla). The All Sky Camera is your prototypical Tim and Paul co-production.